The Mandarin fish has to be one of the most exquisite fish in existence. It has a simply wonderful colouration, pattern and delicacy that makes it a real treat to find and photograph. We have done several dives dedicated to finding these delightful fish that hide amongst both dead and living hard corals and yet have never really had that “wow” moment … until our recent dive with Magic Island Dive Resort in the Philippines. 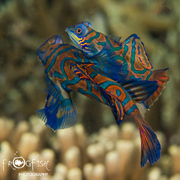 We had arrived in the early hours of the morning and had grabbed a quick snooze to recover from the long journey, but wanted to get diving and pack in as much as we could on our short stay, so we chose an afternoon house-reef dive and a shallow dive to see mandarin fish mating at dusk. The afternoon dive ensured that all our equipment was working and we were hoping that the dusk dive was going to set the tone for this whole trip. Whilst, in the past, we have seen the male dart around looking for the smaller females in the coral, we really wanted to capture the moment these gorgeous fish rise up, out of the coral, to mate. It is a challenge for underwater photographers for many reasons. We were asked not to use any lights (not even those with red as an option), as this can make the fish shy and less likely to perform. We were wondering how our cameras would focus in the diminishing light. Our guide, Jason, said that he would use his torch, mostly covered by his hand, to illuminate the fish using a small beam of light, from between his fingers, when the moment was right. So, we hovered over the coral, letting our eyes adjust to the gloom and waited. We were rewarded with a spectacle like we have never previously witnessed. 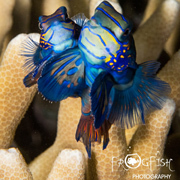 Rather than just the usual toing and froing of the mandarin fish in the reef that we have seem so many times in the past, the pairs rose up in a beautiful dance above the coral and then in a flash (releasing their eggs and sperm) they were gone. The male performs his courtship dance to a handful of females that gather in the same area, and so we were treated to several of these rituals on a single dive. We were the only divers in the water and, with the dive site only a short swim from the dive centre, and in only 6 or 7 meters of water, we had plenty of time to take in this incredible display. 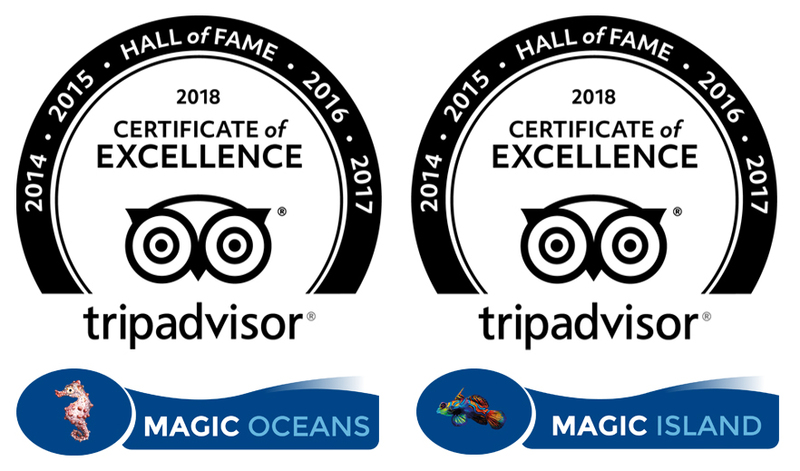 What an incredible start to our time with Magic Island Dive Resort! 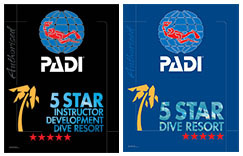 Elated, we finished the dive, hung up our gear and headed to join the other guests staying at the resort for dinner. We shared tales of our diving day whilst all sitting together for a wonderful meal, a few drinks and some great scuba stories. A perfect start to our trip.